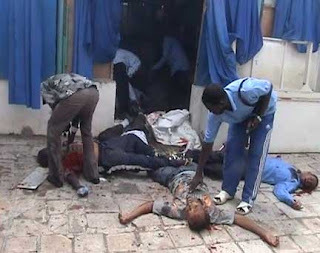 The 2009 Hotel Shamo bombing was a suicide bombing at the Hotel Shamo inMogadishu, Somalia, on 3 December 2009. The bombing killed 25 people, including threeministers of the Transitional Federal Government, and injured 60 more, making it the deadliest attack in Somalia since the Beledweyne bombing on 18 June 2009 that claimed more than 30 lives. The attack took place inside the meeting hall of the Hotel Shamo in Mogadishu during acommencement ceremony for medical students ofBenadir University and was carried out by a suicide bomber dressed as a woman, "complete with a veil and a female's shoes", according to Minister of Information Dahir Mohamud Gelle. According to witnesses, the bomber approached a speakers' panel, verbally greeted them with the phrase "peace", and detonated his explosives belt. Former Minister of Health Osman Dufle, who was speaking when the blast happened, reported that he had noticed an individual wearing black clothing moving through the audience immediately before the explosion. The ceremony—the second since Benadir University was formed in 2002 and a rare event in war-torn Somalia—had attracted hundreds of people. In attendance were the graduates and their family members, University officials, and five ministers of the Transitional Federal Government (TFG). Security inside the meeting hall was light and all of the ministers' bodyguards were outside the hall. The three journalists killed in the bombing were: Mohamed Amiin Abdullah of Shabelle Media Network, a Somali television and radio network; freelance photographer Yasir Mairo, who died of injuries in hospital; and a cameraman alternately identified as freelancer Hassan Ahmed Hagi and Al Arabiya cameraman Hassan Zubeyr or Hasan al-Zubair. Their deaths raised to nine the number of journalists killed in Somalia during 2009, including four for Radio Shabelle. The explosion also injured six other journalists, including two—Omar Faruk, a photographer for Reuters, and Universal TV reporter Abdulkadir Omar Abdulle—who were taken to Medina Hospital in critical condition.The bombing killed 24 people and injured 60 others.Most of those killed were students, but also among the dead were two doctors, three journalists, and three government ministers—Minister of EducationAhmed Abdulahi Waayeel, Minister of Health Qamar Aden Ali, and Minister of Higher Education Ibrahim Hassan Addow were killed. Minister of SportsSaleban Olad Roble was critically injured, and was hospitalised. He was later reported to have been flown to Saudi Arabia for treatment, where he died on 13 February 2010. The dean of Benadir University's medical college was among the wounded. President Sharif Sheikh Ahmed accused the Islamist group al-Shabaab of perpetrating the attack. responsibility for orchestrating the bombing, but SheikhSharif Sheikh Ahmed, the President of Somalia, blamed the Somali Islamist group al-Shabaab. Sheikh Ali Mohamud Rage, a spokesperson for al-Shabaab, denied being responsible for the attack and, in turn, blamed the government. The leader of Hizbul Islam, another Somali Islamist group, also denied responsibility. In a news conference held in the Hotel Shamo after the attack, President Ahmed called for international assistance to Somalia. He also displayed, according to a local journalist, what he identified as the bomber's body and remains of an explosive belt and a hijab. The Danish newspaper Berlingske Tidende reported the bomber was a 23-year-old citizen ofDenmark. According to Idd Mohamed, a senior Somali diplomat, the attack was carried out to foster "terror" and "panic" and undermine the legitimacy of the Transitional Federal Government. Wafula Wamunyini, the acting head of the African Union Mission to Somalia (AMISOM), expressed a similar opinion, claiming that the attack had the purpose of "intimidat[ing] and blackmail[ing]" the Somali government.Stephanie McCrummen of The Washington Postdescribed the attack as "the worst blow in months" to the United Nations-supported government of Somalia. The attack drew condemnation from a number of organisations, including the African Union (AU), the European Union, the United Nations Security Council, and the National Union of Somali Journalists. AMISOM described the bombing as "inhumane and cowardly", and characterised it as a "heinous [crime] against humanity". AMISOM also promised to "spare no efforts" to identify and bring to justice the perpetrators of the attack, and stated that the attack would not deter the AU from continuing to carry out its mission in Somalia. Baroness Catherine Ashton, the High Representative for Common Foreign and Security Policy for the European Union (EU), echoed AMISOM's sentiment, calling the bombing a "cowardly attack against civilians including students, doctors and journalists". The UN Security Council president Michel Kafando labelled the attack an act of terrorism and a "criminal act", called for a "thorough investigation", and conveyed "sympathies and condolences" to the victims of the attack, their families, the TFG, and the Somali people. A joint statement by the UN, the EU, the Arab League and the United States affirmed that the international community would continue its support of the Transitional Federal Government; however, a senior European diplomat indicated that any additional military support to the TFG was unlikely. President Ahmed characterised the attack as a "national disaster". The Committee to Protect Journalists issued a statement expressing condolences to the families of the three journalists killed in the bombing and noted that the attack "cemented" Somalia's "position as the deadliest country in Africa for journalists". published by.18/05/2010. Habiba Ali Mohamed Reported in Somalia Zon call. 0046722988113 www.biikole.blogspot.se.